Most knitters have at least tried to knit socks but many of us have a love of creating those unique pair of toasty warm socks. It is a bit crazy, considering that you can buy a three pack in Wal-Mart for a few bucks but many of us will go out and spend ten to twenty dollars on yarn and a week or longer of our blood, sweat and tears. Blood because of the small sharp pointy needles, sweat due to trying to follow intricate patterns while using small sharp pointy needles and tears when one of those needles fall out and you lose your place in the pattern. There are several ways to knit socks. 1- Toe up. This is what I’m working on. It is easier because you can try it on as you knit and don’t have to worry about running out of yarn. 2- Double pointed needles. Take 4-5, five to seven inch long needles and spread the stitches out between them. Work in the round and try very hard not to allow the needle to fall out. 3- Two circular needles. The stitches are split between the working points of two circular needles. 4- Magic Loop. This uses one circular needle that is at least 40 inches in length. The stitches are split between the cable and the working needle point. One side is worked, moved and the next side is worked. 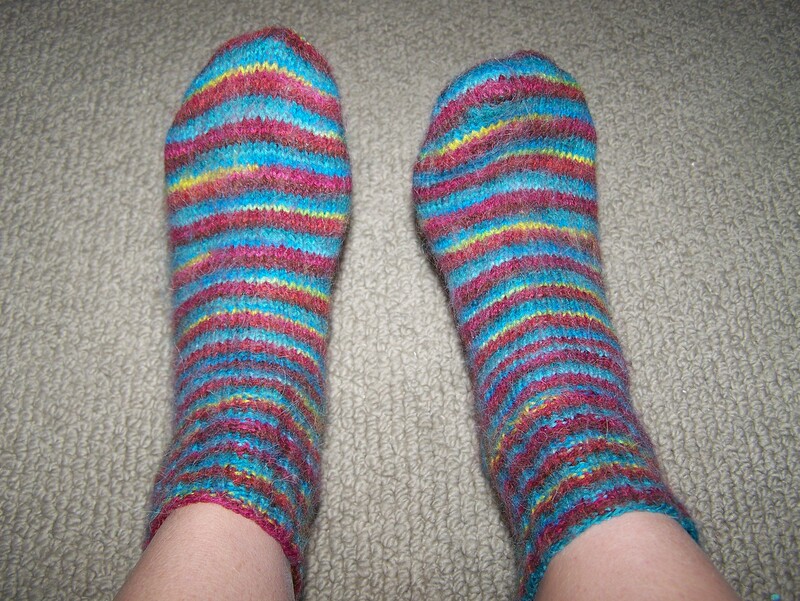 5- Two socks on two circular needles. I haven’t figured out how to do this, but there are many books and websites willing to explain further. Someday I will conquer this too. 6- Cuff down. This is the classic method that most patterns refer to. You work on dpns, knitting from the cuff down to the toe.